Our Favorite Thanksgiving Picture Book! So what do we do? One tradition we've kept for years now, even with the older set of children far too old, is read a favorite Thanksgiving picture book. 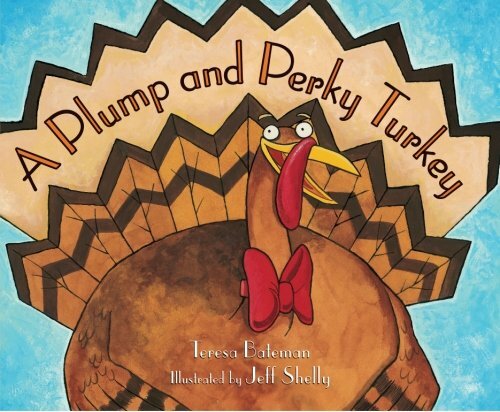 My personal favorite (and perhaps one of my favorite picture books of all time) is A Plump and Perky Turkey by Teresa Bateman. I love everything about this book. The brilliant rhyme, the flawless rhythm, the adorable story, the zany illustrations. It's a delight to me every time I read it. When my older kids were in school I'd even bring it to the annual Harvest Party to read to the class - because everyone MUST know and love this book! This year I feel the need to add poetry geared toward my almost-adults. I stumbled upon this poem when preparing Penny's Five in a Row (homeschool studies), and fell in love. The language is a delight, and this particular rendition absolutely heartwarming. I plan to print out the poem itself so the richness of the dialect won't be missed. Here's the text to When the Frost is on the Punkin by James Whitcomb Riley from the Poetry Foundation. Of course with little hands around, there's much to do, but I don't always want extra helpers in the kitchen. Crafts are in order! Beyond the purchased kits from craft shops (which I buy on sale/with coupons early in the season) there are endless crafts for Thanksgiving on Pinterest, BHG, everywhere. They range from simple to over-the-top. This year I wanted some cute printables to keep little ones busy, and here's my favorite set. Plus, it's free! Beyond the family feasting, how do you celebrate Thanksgiving? Favorite books, songs, movies, activities?